Today would be Lewis Carroll's 179th birthday. My friend Patt, pointed this out to me earlier in the week. She doesn't care for "Alice in Wonderland", while I did my senior thesis on nonsense language in "Alice Through the Lookingglass and What She Found There", which is the full title of Carroll's 2nd work, "Through the Lookingglass". It is in "Through the Lookingglass" that one of my favorite poems is found. It is in Chapter 6. Alice is talking to Humpty Dumpty and she asks about the meaning of the poem. I was quite taken by the poem and committed it to memory. In college, one of my English professors declared that memorizing poetry increased your word power as well as brain power. Part of the final in her class was to memorize 12 lines of anything by one of the authors we read in class. I shall never forget it. 12 lines from "The Rime of the Ancient Mariner" by Samuel Taylor Coleridge. Day after day. Day after day. We stuck, nor breath nor motion. Yes, that is from memory. I can recite Jabberwocky, too, but I won't. I do agree with that English teacher even if I find myself standing more often in the center of a room wondering why I came in here. Memorization is good for you. I don't think kids are challenged enough in school to do that. Oh yes, we have to memorize facts and dates and formulas and all sorts of things, but memorizing poetry expands your mind. 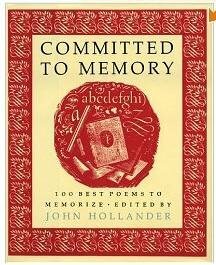 This is a great book, if you are looking to challenge yourself to memorizing poetry. It's in my "to be read" pile. I bought it when it came out. I've memorized a lot of things since then, some might be in this book. I admit to not opening it in years, but the collected poems were, from what I remember, great examples of poetry. You also couldn't go wrong with memorizing lines from some of Shakespeare's soliloquies. I memorized Antony's oratory over Caesar's body. "Friends! Romans! Countrymen! Lend me your ears! I come to bury Caesar, not to praise him. The evil men do oft lives after them while the good lies interred with their bones. So let it be with Caesar." That's all I remember from that. And I did know most of Hamlet's "To be or not to be. That is the question. Whether 'tis nobler in the mind to suffer the slings and arrows of outrageous fortune or to take arms against a sea of trouble and, by opposing, end them. ", but I've forgotten parts of that, too. These soliloquies are probably still with me. I'd just need prompting to remember them in totality. I leave you with one of the funniest versions of "Jabberwocky" I've ever seen.